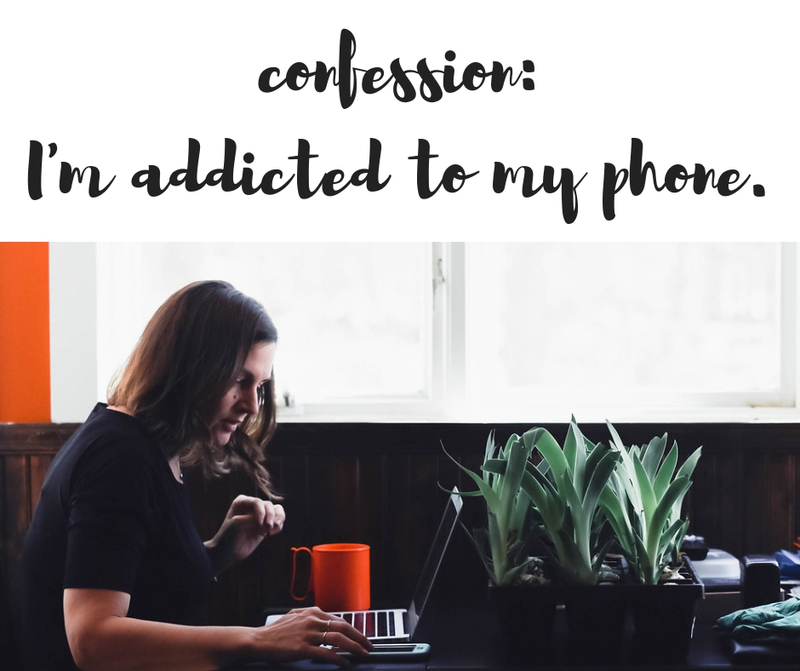 CONFESSION: I'm addicted to my phone. The whole thing is silly, really. I mean, addicted? to a phone?? REALLY??! But, yep, it turns out its a very real thing. We as humans love instant gratification and our phones provide that for us. And all those notifications we get? Yep, we love those too. We get a rush of a happy hormones when we get notifications about likes, and replies, and I don’t know about you, but I mindlessly check them. And then check them again. I use my phone A LOT. Now, one could argue that I’m ‘working’ and sometimes I am. But, if I’m being honest, I’m doing a lot of other things that aren’t work. I read a book called Off: Your Digital Detox for a Better Life, that helped me become more aware of how bad the problem is and ways to start to take control of it. Anytime I get in the car-sometimes I spend 5-10 minutes just sitting in the parking lot catching up on social media before I get going. That’s super silly. I also started watching my screen time use thanks to the new feature on iphones. I use it as a check throughout the day, and if I’m above average, I make sure to set my phone down and take a break. Here are a few ways I’m trying not to pick up my phone so much. Setting a limit on app usage (especially social media!) iphone lets you set limits with the new screen tracking. I set the downtime from 9:00 pm to 7:00 am, so I’m not able to use apps during that time. It’s very helpful. Leave it downstairs and in the kitchen at night. It never comes up to bed with me anymore. And for those of you that SWEAR you need it for an alarm clock, you’re fooling yourself, buy an alarm clock. Block time in my day to answer messages, post, or do anything on my phone. I also have started to use my computer to respond to facebook messages-its much faster to type them, and I find that I am more focused if I sit down to respond all at once. Not check it right away in the mornings. Sometimes I’m good at this, sometimes I’m not. But I’m trying to be more present with Holtan, especially during mealtimes. Leaving it in the car when I’m running my errands. I tend to get distracted by it when I’m grocery shopping, etc. I can get errands done a lot faster if I don’t have it with me. Stop checking Facebook and instagram excessively. I sometimes find myself going back and forth between them not even thinking about it. I deleted the apps from my phone one weekend, and I really didn’t miss them, in fact, it helped me “log off” for time for myself or with me family. I have been periodically deleting them from my phone when I feel like its getting out of control again. Have a notebook open and a pen available and when I feel the need to message someone or post something, write it down instead, then later come back to it, and during my blocked phone time, that’s when I can do whatever I need to do. I am by no means perfect at ANY of these, but I’m doing the best I can. And when I find that I set my phone down, and focus, I can get more done, I feel better about myself, and I have more meaningful moments with my family. Do you use your phone too much? Do you set “rules” for yourself to keep your phone use in check?